Monopoly Boards Are Circular Now. Circular! 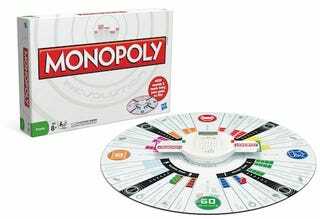 For its 75th anniversary, Monopoly's getting a massive update, pitting brazen and new against proven and old: Circular board or quadrilateral? Cash currency or fake credit cards? This is the stuff of ruined relationships. In the monopoly wars, I'm imagining there will be two camps, not four. there will be people who are OK with the circular board and the switch to digital currency, and people who are fine with neither—the purists and the pragmatists. There will be a middle ground in this fight, but it will be drenched in blood. I think I might be one of the purists. I get that the new design makes a bit more sense, and that giving players credit cards is less trouble than managing a bank full of cash. But you know what would be even less trouble? A video game. Monopoly Revolution will be out in Fall, for $35. And don't worry—you'll still be able to find old-style boards, too.